Yesterday we escaped the bunker for an hour to take a walk in a different neighborhood for once. We decided to stroll along the banks of Stow Lake in Golden Gate Park. Stow Lake. Nikon D300 with 18-200mm Nikkor at 18mm and f11, 1/125 second at ISO 400 with a circular polarizer, processed in Photoshop CC 2014 with Adobe Camera Raw 8.6. 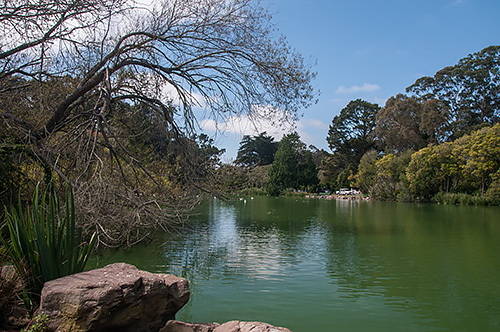 It was overcast at the bunker but the sun was shining at Stow Lake. A blue sky with some decorative clouds and a skywriter frustrated by a bit of wind capped the bucolic scene. The turtles were sunning themselves on rocks. The geese were making emergency landings. The ducks were ducking. Couples strolled. Dogs were walked.